- Everything must ice and ice-cold, except the liquors. - Fill the freezer with ice. - Mix or shake with ice but do not pour the ice in the glass. Use a strainer. - Use new ice for every cocktail. - Crushed ice: take a small bag with ice and beat with a (meat) hammer to pieces. - A cocktail can be mixed in 3 ways: stir in a blender, shake in shaker or mix in the glass. - Squeeze: squeezes some lemon or orange into glass or shaker. - Twist: garnish with a lemon peel. - Dash: just a few drops (mostly the bitters). - Jigger: 42 cc (=1 shot glass). 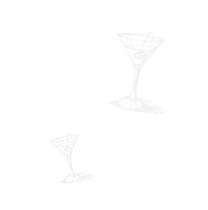 - Total cocktail quantity is always approximately 60 cc, the recipes use 1/2, 1/3, 2/3 etc. - Care to have metric jiggers/messure pourers of 10 cc. - Be careful with bitters in the recipes: predominating taste.